Your applications need somewhere to keep your settings and application changes so they are persisted across sessions. By default App Manager will store your configurations in a local file database (.sdf file) on the server. However, the Configuration Store feature provides the ability for you to manage this setting and specify a specific database if you choose. Note: See the "Advanced Configurations" section for details on configuration architecture, database requirements, and other technical details. Select a database type from the Database Type dropdown. Enter your database connection string in the Connection String input box. Click TEST CONNECTION to verify the connection works. This exercise demonstrates migrating a TDS configuration store from SQL Server Compact Edition (the default) to an enterprise database (SQL Server or Oracle). When using an enterprise database (such as SQL Server or Oracle) as a configuration store, the database should be a new empty database and the connection to this database should use a database user that is the schema owner of its own schema (a user with read/write to its own schema only). When configuring this "Configuration Store" connection string, it is important to use a database user that does not have access to anything outside of this "TDS" configuration database - to mitigate any risk of inadvertently modifying or accessing other data. Click here for more details. Make sure the new configuration store database is empty. Make sure the connection, which will be configured in TDS, to connect to the new configuration store database has privileges to read, create, and delete objects (only to the desired schema though). Make a backup of the application and existing configuration store, as a precaution. Install the latest available Transcend software (TDS and other applications) to insure you're running the most up to date versions. Launch the App Manager (TDS) application. 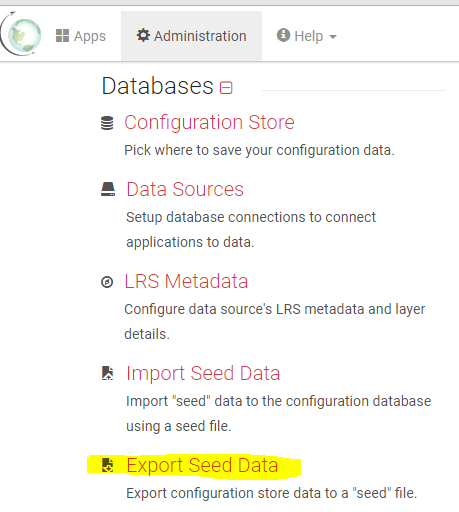 Click the Export Seed Data link. Select all items you want to “migrate” to the new configuration store. Heads Up! Any items that have approximately 1,000 or more records should not be exported. This seed export step will export to a single text file and it is not practical to export extremely large amounts of data this way. Heads Up! If you have the Road Video Viewer product, do not select Camera Images or Event Points – these items should be seeded using the original seed files generated through the TIM processing tool. Click the DOWNLOAD SELECTED button (and continue). Wait for the seed file to download. Click the Configuration Store link. Select the Specify a database option (if it is not already selected). Note: You may want to copy this original connection string in case you need to revert to this configuration store at any point. Select the database type to change the configuration store to. Enter the connection string to the new configuration database (see prerequisites for details on this database). Tip: Use the Examples dropdown menu to see available connection string examples. Verify that the connection succeeded. Click the SAVE (and confirm) button. The application may take several minutes to swap to the new configuration store and setup the new database objects – please be patient. It should take you back to the Administration page once it is complete. Note: If you receive an error message, and are locked out of the application manager UI, you can always swap the configuration store connection back to the original connection by opening the TDS web.config file and updating the connection string and provider name – for the “DefaultConnection” connection string. Click the Configuration Store link and verify that the correct new database connection information is showing. Click the Import Seed Data link. Drop the seed file (the one that was exported earlier) into the gray box (optionally you can click on the gray box and select the file). After a moment, the page will show a Seeding Job History list and you should see the status of the seed file import. Remain on this page until it is complete – it can take several minutes depending on the amount of data being imported. 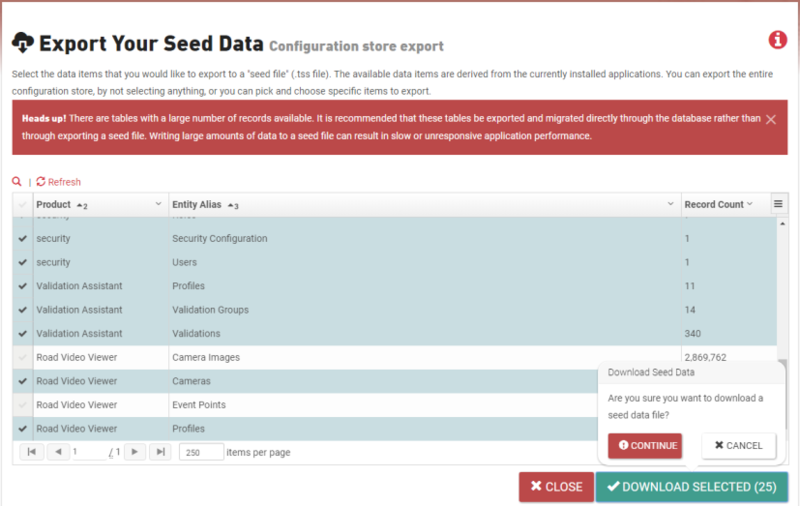 Once the seed file process is complete, you can click on the Details link to check for any import errors. Check the Last Message details to verify that there are 0 errors. At this point the new configuration store should be restored to the previous (based on what you selected to export to the seed file). Navigate through the App Manager Administration and Apps pages to verify that all the expected profiles and settings are in place. Test each application and verify that all data and settings are present.